Powder metal (PM) gears normally sell due to the lower cost and their relatively high mechanical performance. The reason behind the lower cost is that most of the machining is omitted due to the net-shape forming process. So how net-shape are powder metal gears? In this article some hard-to-find information about the tolerances through the manufacturing steps will be presented. This article focuses on bending fatigue strength improvements of P/M gearing from recent improvements in P/M technology, combined with shot peening. The data discussed in this article was taken from an upright vacuum cleaner. This was a prototype cleaner that was self-propelled by a geared transmission. It was the first time that the manufacturer had used a geared transmission in this application. Electrification has already started to have a noticeable impact on the global automotive industry. As a result, the drivetrains of hybrid (HEV) and full electric vehicles (EV) are facing many challenges, like increased requirements for NVH in high speed e-Drives and the need for performance improvements to deal with recuperation requirements. Motivated by the positive validation results of surface densified manual transmission gears which are also applicable for dedicated hybrid transmissions (DHTs) like e-DCTs, GKN engineers have been looking for a more challenging application for PM gears within those areas. The properties of both shot-peened and cold rolled PM gears are analyzed and compared. To quantify the effect of both manufacturing processes, the tooth root bending fatigue strength will be evaluated and compared to wrought gears. The complete Product News section from the July 2014 issue of Gear Technology. 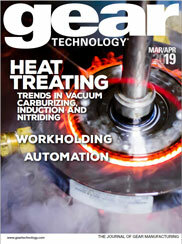 The complete Product News section from the January/February issue of Gear Technology.